Heat naturally flows from a hot area to a cold one â€” so an air conditioner has to mechanically compress the gaseous refrigerant into much hotter liquid form and pump it through outdoor coils from which it can release the heat it has absorbed. A typical air conditioner can use 6,000 watts. But let’s say you are considering putting your own power plant on your roof. You have decided to go solar. 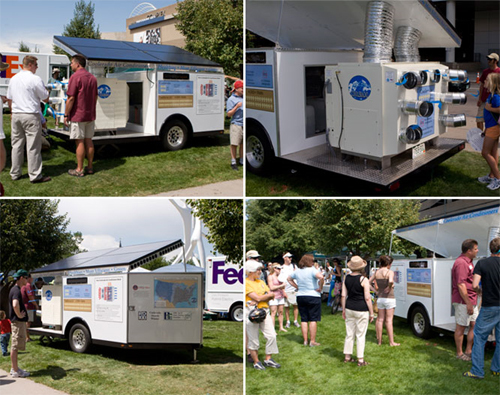 Instead of putting in another 6 KW of solar power on your roof to power a traditional energy guzzling air conditioner – take a look at a completely different kind of air conditioner to go with your solar installation:Â The Coolerado can cool 3,000 square feet with just 600 watts of power;Â or just (depending on watts) 3 or 4 solar panels. That’s one-tenth the amount of power the traditional air conditioning system needs. 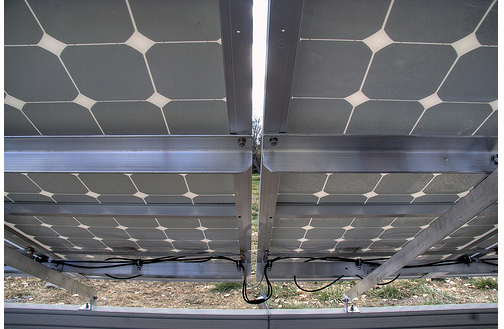 So you can use the moving air to cool off the panels –relatively speaking:Â solar panels can get as hot as 150 degrees on a hot sunny day, but the fan blowing air exhaust from the Coolerado can bring them down to about 110 degrees, making them produce electricity more efficiently than un-cooled solar panels in the same climate. This entry was posted on Wednesday, June 10th, 2009 by Susan Kraemer and is filed under Green. You can follow any responses to this entry through the RSS 2.0 feed. You can leave a comment. This sounds good, but they are only appropriate in areas of low humidity. Their own maps show less than half the US being suitable. Seems to be just a fancy swamp cooler.